Our Scheduling system is constantly seeing improvements and enhancements which means that the pages can get more and more complex with each additional feature. Unless you take the time to step back and view things through the eyes of a “newbie”, this cycle will just continue on until its just not usable anymore! 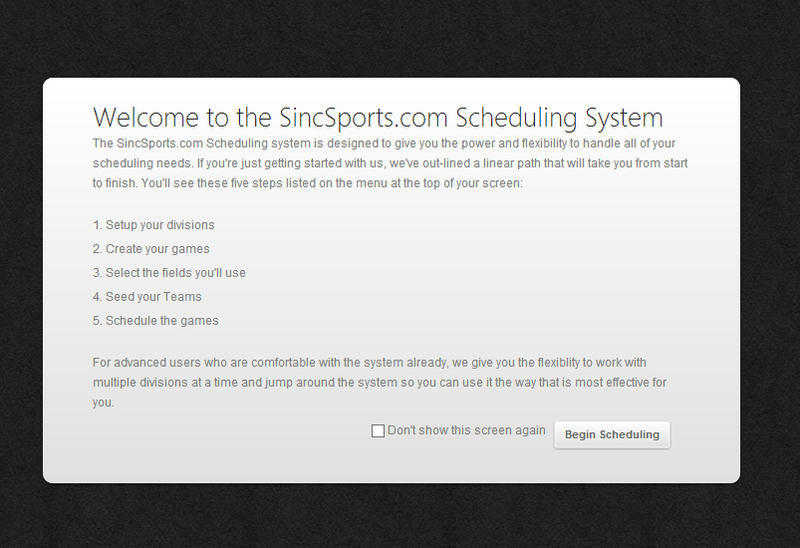 SincSports is dedicated to making sure that never happens so we are constantly reviewing our system and are dedicated to making the changes necessary to keep things as user friendly as possible. Our most recent victim was our scheduling system. Since we have so many clients using the system already, we wanted to make sure that we didn’t change any of the existing functionality – just worked through the usability factor to make sure things are clear. When a new user enters the scheduling system, we want take this opportunity to introduce them to the steps they’ll walk through to take their schedules from start to finish. For those of us who have used it multiple times throughout the years, this process is second nature. However, we want to make sure that our new clients understand the steps involved. Once you enter the system, you’ll be asked to identify your divisions. We’ve updated this screen to allow you to set the name you want to use for each division as well as the number of teams you’ll have. You can easily see which items need your attention since they will be have a yellow button. Click on the “GO” button to go right into this step. 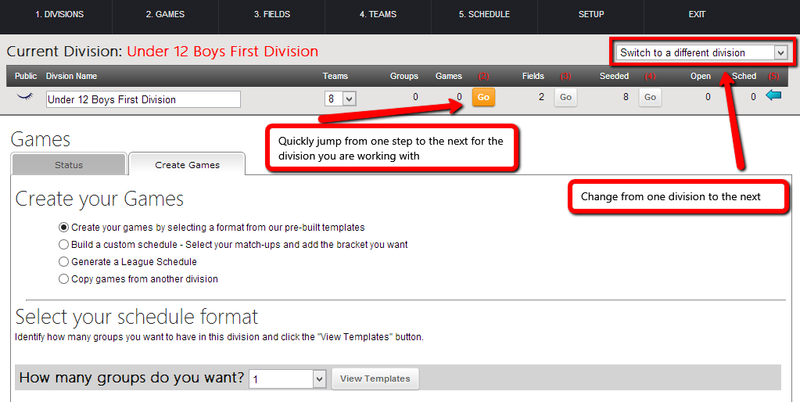 After identifying your divisions and the number of teams, you’ll create the games for each division. Again, with tremendous flexibility, we can sometimes introduce complexity. We’ve simplified this screen to present only the information that applies to you for that division at that time. Choose from our numerous pre-built templates or generate a custom schedule that meets your every need. You’ll also notice that the division you are currently working on and the status of each task will appear across the gray bar at the top of your screen. You can quickly jump from on step to the next by using these buttons. The modify template screen also received some work. This screen is a great tool when a pre-built template ALMOST matches what you need. You can select a template that is close and then go to the “Modify Games” screen you see below. You can then add additional games, edit ones that are there to change the match-ups, delete games you don’t need, or even add a single elimination bracket onto the end. 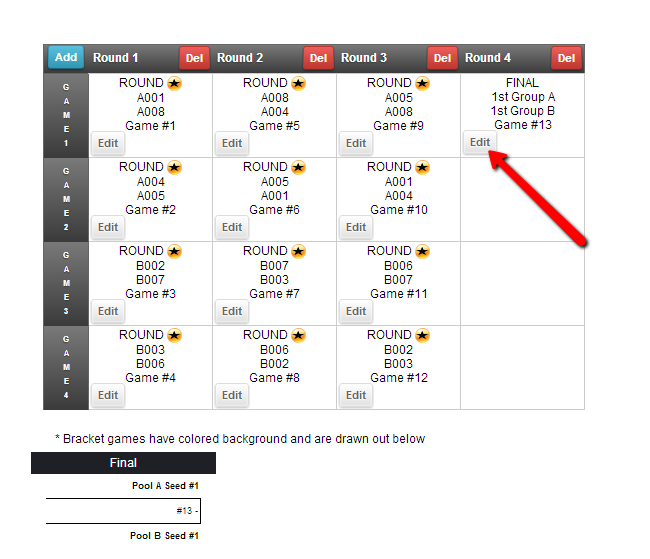 Since bracket games can sometimes be a little intimidating in this grid layout, we’ve updated the screen to highlight where it fits in the bracket (which will appear at the bottom) to make things much easier to follow! You will notice some additional (mostly cosmetic) changes to the scheduling system, but the tools and functionality that you’re used to will still be right there for you!